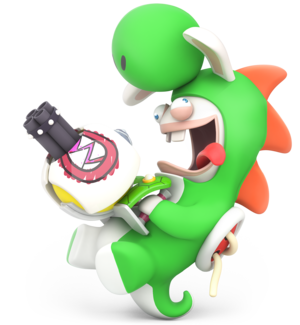 Rabbid Yoshi is a Rabbid dressed as Yoshi, and one of the eight main heroes in Mario + Rabbids Kingdom Battle. In Mario + Rabbids Kingdom Battle, Rabbid Yoshi teams up with Mario, Luigi, Princess Peach, Yoshi, Rabbid Mario, Rabbid Luigi, and Rabbid Peach to save the Mushroom Kingdom from Rabbid-fused enemies and Bowser Jr.'s attempted takeover. In the game, he has average offense and mobility, as well as great defense. Rabbid Yoshi's primary weapon is the Rumblerang, a gatling gun-esque weapon that deals several hits, resulting in either sub par, or tremendous damage. Rabbid Yoshi's secondary weapon is the Grenaduck, an explosive rubber duck that functions similarly to a grenade. Rabbid Yoshi's dash is similar to Rabbid Peach's Stylish Dash, though Rabbid Yoshi is allowed to have more dashes (with the maximum being 5, as opposed to Rabbid Peach's 4). Rabbid Yoshi's first special ability is Outer Shell, which is a high-risk, high-reward shield that nullifies all movement or weapon damage, though it can only take one hit from an enemy (however, a Skill Tree upgrade allows Outer Shell to sustain two hits). Rabbid Yoshi's second special ability is Scaredy Rabbid, which repels any nearby enemies. Like Rabbid Mario's Magnet Dance, it can also be used in conjunction with "line-of-sight techniques" or weapons that have a high chance of inflicting Burn, Push or Bounce. Like Rabbid Luigi's Super Barrier, Rabbid Yoshi's Outer Shell ability can also be used in tandem with Princess Peach's Protection ability to reduce damage greatly. Rabbid Yoshi is described as crazed, tending to act before thinking about the consequences. His personality is similar to most other members of his species; reckless, crazed, mischievous, and playful. However, when compared to other Rabbids, Rabbid Yoshi could be considered even more hyperactive, a trait supported by his decision to keep his own weapons in his mouth, as well as the many wild facial expressions he pulls. He is also shown to be trigger-happy during the defeat of Calavera in Spooky Trails, where the Rabbid chose to keep shooting at Calavera despite the battle being over. He's the Rabbid which the group probably has the most difficulty controlling. This page was last edited on October 30, 2018, at 15:39.